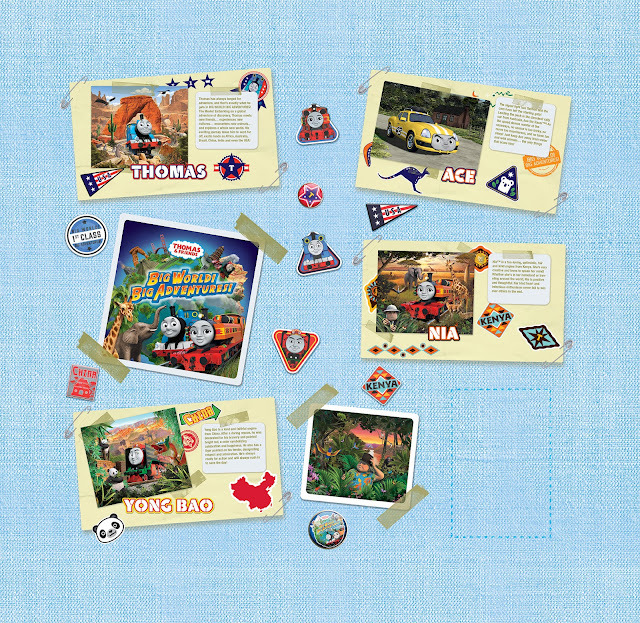 For over 70 years, Thomas & Friends™ has been entertaining children around the world from the vibrant island of Sodor. Now, Thomas will embark on the most exciting transformation in content ever-to-be-seen – as he expands his horizons and travels around this amazing world in Thomas & Friends™: Big World! Big Adventures!. This new movie tentpole and series will be pivoted to make the show more entertaining, inclusive, meaningful, and global. The new content refresh will feature faster paced stories, with a focus on fantasy, humour, animals, and musical sequences. Taking the role of the narrator, Thomas will now speak directly to his viewers, creating a more personal and meaningful experience with the No. 1 blue engine. Moving forward, Thomas & Friends will also see the formation of a new core Steam Team with an equal number of girls and boys in the lineup (Thomas, Gordon, James, Percy, Emily and new characters Nia and Rebecca) ensuring gender inclusivity and speaking to a broader audience across the show. In Thomas & Friends: Big World! Big Adventures!, Thomas’ dream of seeing the world will motivate him to travel across deserts, through jungles, and over mountains as he journeys to Africa, Brazil, USA, and China. Joined by Nia, a female character from Kenya and a new member of the Steam Team, Thomas will travel farther than he has ever been before, experiencing new cultures and making new international friends. “With Thomas & Friends: Big World! Big Adventures!, Thomas will introduce preschoolers and young children to the bigger world around them through the wonder and awe of trains. While the show will still have an emphasis on the importance of friendship and teamwork, it will also be more exciting and educational than ever before. Kids can now discover new countries and cultures together with Thomas, their trusted friend for adventure and discovery as they grow up,” said Audrey Ng, Assistant Brand Manager for Infant & Pre-School at Mattel Southeast Asia Pte. Ltd. (Mattel). With his worldwide trip underway, Thomas is inviting fans to discover the world with him at the Thomas & Friends: Big World! Big Adventures! event at the Curve. From 10AM to 10PM, between 14 and 26 August 2018, kids can meet life-sized replicas of Thomas and his friends, trek through an obstacle-filled maze in Nia’s Jungle Safari, visit Yong Bao’s Great Wall for puzzles and quizzes, and get comfy and enjoy never-before-seen videos of Thomas & Friends in a mini beanbag theatre. Mattel is partnering with the Curve to bring this event to life, offering exclusive goodies and redemption offers at the Centre Court throughout the campaign. Every day, the first 1,000 kids to visit the event will be given a special Thomas & Friends Passport, which they can complete to win a special Thomas & Friends gift. In addition, shoppers who spend RM120 and above on Thomas & Friends merchandise will be able to redeem a limited edition 2-in-1 playmat carrier while shoppers who spend RM150 and above can redeem a 2-in-1 playmat carrier and an exclusive Thomas Train Ride around the Centre Court. Redemptions are subject to terms and conditions, available only while stocks last. Fans can keep themselves up to date with Thomas & Friends: Big World! Big Adventures! on the official YouTube channel: https://www.youtube.com/thomasandfriends. Brand new videos will be available – with 5 sing-along karaoke videos and introduction videos for Thomas’ new friends from around the globe: Nia, Yong Bao, and Ace. Fans can also visit the Thomas & Friends Facebook Page (https://www.facebook.com/sea.thomasandfriends) to find out more about the new content as well as the Thomas & Friends: Big World! Big Adventures! event.